we define the core components of the service or business process that you want to offer. usage of an industry-neutral language to model the core components is essential. UML is ideally suited for this task. we translate the obtained UML models into XML DTDs, or schemas according to XMI guidelines. 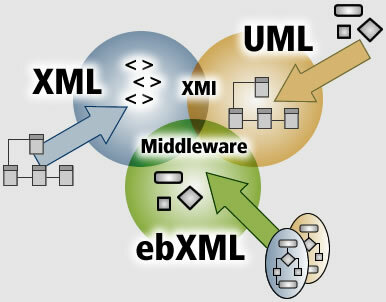 a Middleware solution such as Biztalk or webMethods will send the obtained XML messages to the trading partner. a SOAP envelope routes messages to their destination and provides security and fault tolerance. use it to register your web services and let others know what services you can provide. automatically generated description of the interfaces of a web service.